All practices – regardless of size – face multi-faceted risk exposures. Poorly written patient records, failing to handle a complaint properly, or outdated infection control policies can result in legal complaints, investigations, or lawsuits. When it comes to risk reduction, think of us as your front line resource and advocate. Clients choose us for our ability to simplify complex regulations, provide easy-to-implement solutions, and deliver a user-friendly experience. 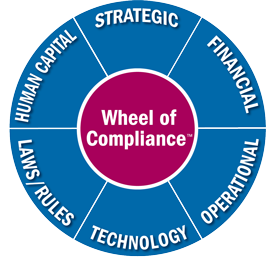 Our comprehensive specialty services range from an in-depth analysis (utilizing our Wheel of Compliance™ Philosophy) to telephone coaching. We offer the choice of remote or on-site consulting depending upon the needs of your practice. Remote consultation offers you a cost-effective way to access the experts, while on-site analysis and consultation provides personalized, hands-on assistance for your team. Each member of your team will benefit from Linda’s unparalleled credentials and experience. Read more about our services and reduce your risk- starting today! Recordkeeping techniques you learned even five years ago may not be sufficient to defend your care before the licensing board or a judge. Electronic recordkeeping completely changed recordkeeping standards. Understanding electronic nuances such as templates and audit trails is critical. In this litigious society, be proactive by taking time to have your recordkeeping techniques evaluated before an event occurs. Read our Top 10 Recordkeeping Tips to brush up on a few of the basics.